Weekends, what’s not to love? Extra time to spend with your friends and family, dining out, sleeping in… But, if you’re not careful with your choices, the weekend can really derail your phentermine weight loss results. Between after-work drinks on Friday, lazy brunches, parties, and take-outs, the weekend is full of opportunities to eat tempting food and undo all the good work you put in during the week. So, if your best intentions are often undone by the lure of letting loose at the weekend then read our tips to avoid the weekend weight gain. It’s hard to stick to your diet at the weekend, when our schedules are less regimented than during the working week. If you’ve had a good week then putting pressure on yourself to lose weight over the weekend has the potential to cause stress and lead to emotional eating. Take a more realistic approach to your weight loss journey and aim to just maintain your weight instead. This way, if you weight the same on Monday as you were on Friday you can consider yourself a success. And, if you do happen to lose then that’s an even better way to start a dull Monday morning! How you start the weekend can set the tone for the coming days; if Friday night means some happy hour cocktails then a pizza, it’s easier to let things slide for the rest of the weekend. Inevitably, this can ruin the effort you put in during the week. It also makes it harder to reset good habits once the workweek starts again, even with the help of phentermine. Kick your weekend off the right way with a tasty but reasonable dinner option, such as a fine cut of lean red meat to ensure taste satisfaction without the calories. And if you plan on dining out, follow these tips to make better menu choices. Sleep is important when it comes to weight loss; too little and we’re at risk of cravings, stress-eating and weight gain. But, that doesn’t mean you should sleep in until the afternoon at weekends. A disrupted sleeping schedule can make it difficult to sleep on Sunday night and a tired start to the workweek. We’re not suggesting that you’re up at dawn at weekends, just try and go to bed at a reasonable hour and then set your alarm for around 8 hours later. If phentermine is causing insomnia then these tips should help you to combat this common side effect and get the rest you need to succeed. Instead of your usual breakfast smoothie gulped down before you rush to work, enjoy a leisurely breakfast at the weekend. But, this doesn’t mean pancakes and waffles! Simple carbs like these only lead to sugar cravings throughout the day. Instead, opt for something filling and healthy, such as a spinach and mushroom omelet and benefit from a great protein boost to keep hunger at bay for hours. As we explain here, even small amounts of exercise can help increase your fitness level and boost weight loss. And with the help of your morning dose of phentermine, you should be raring to go! So, before you make plans to enjoy the day ahead, allot some time into your morning to work up a sweat. Putting it off until later in the day gives you the chance to get too busy and end up not doing anything. If you are feeling tired lately then exercise can actually help to boost your energy, as well as many other benefits. You also might want to try adding a multivitamin or supplement into your daily routine to increase energy levels. Sometimes it can be easier to get your eight glasses a day when you’re working as it gives you the chance to take short breaks and you might also be lucky enough to have a water cooler at work. Make sure that you keep up this good habit during the weekend by always having a bottle of water in your bag and filling it up when you have the opportunity. Once you get into the habit, you’ll wonder how you ever managed without it! And, keeping yourself hydrated will help with the phentermine side effect of dry mouth too. Planning ahead isn’t just for weekdays; planning out your meals saves time and means you’re less likely to stray from your healthy eating regime. So why not do the same for weekend too? Cooking in bulk when you have more time and freezing meals means you have standby dinners if you come home late after work. But sometimes weekends can be haphazard too, since we don’t tend to stick to a timetable. Having healthy food in store for when you’ve been out all day with the kids or friends makes perfect sense. The same goes for snacks; if you’re out it’s difficult to find healthy snacks so make sure to always have a healthy snack with you for when hunger inevitably strikes. Dining out at the weekend is a great way to enjoy time with friends and family. But tucking into grilled lean meat and veggies might not be the most exciting prospect. The key to not feeling left out (and therefore running the risk of suffering a slip) is to opt for one extravagance. So, whether it’s a dessert or a portion of your favorite side, pick your treat wisely and savor it to make sure you really enjoy the experience. Plan your treat for when you’re around loved ones as it will make it that much more enjoyable. We hope this information helps you take on the weekend without the weight gain! However, if you feel that even with phentermine, finding motivation at the weekend is hard, then adding Phen Caps to your routine could be just what you need. 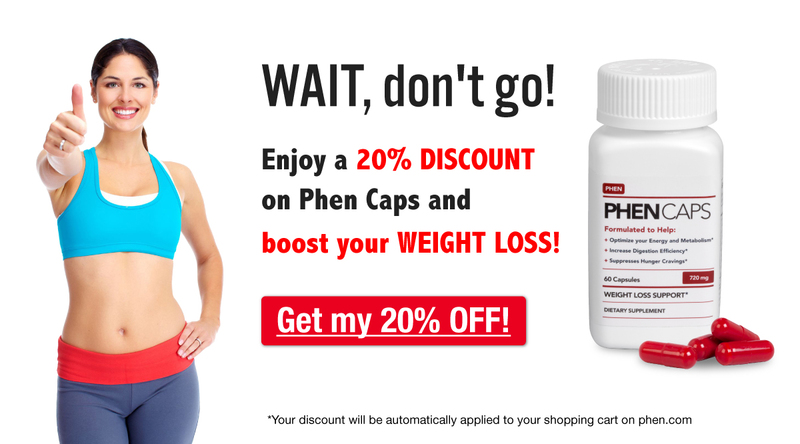 Phen Caps support and complement the effects of phentermine by boosting energy and suppressing appetite – perfect for giving you a helping hand when you most need it. How do you handle weekends? Do you let loose come Friday night, or do you try to stick to your plan throughout the weekend? Let us know by commenting below! love your updated website. Will use it as my diet buddy, since I live in Nicaragua, no longer in the U.S.
Hey Kenna, thanks for the feedback, we’re glad you love the site! Let us know if there are any topics you want us to cover in a blog post!